New to the Kings Race program, is the addition of the Steel Kings Extra Sound Plus. This shoe gives you the great shape of both the Steel Kings ES and the Alu Kings ES which fit perfectly to the thoroughbred foot with the minimum shaping, but also offers a thicker section. This thicker section gives improved wear and strength, making it ideal for use on many different types of horses which require a concave shoe for grip, but also a lighter shoe for better performance. As always Kerckhaert only uses the highest quality steel available which helps set Kerckhaert shoes above other brands. A wider, more upright heel on the front shoe allows you to fit the shoe with better cover and support. 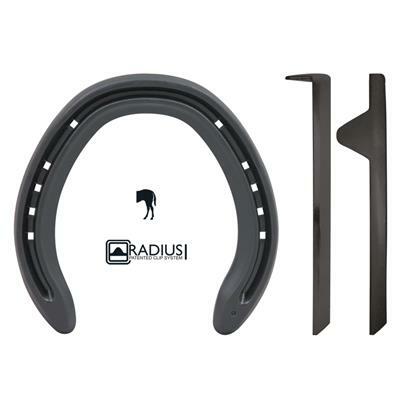 Strong radius clips reduces the risk of spreading a shoe and are easy to fit into the hoof wall with minimum amount of wall being removed. The nail pattern is exactly the same as both the steel and aluminium version, allowing you to reuse old nail holes if needed, which helps the hoof stay in optimum condition. The front shoe is symmetrical, while the hind shoes keep the same left and right pattern.